Today we are observing Advaita Acarya’s appearance day, which is on saptami tithi in the month of Magha. Advaita Acarya appeared first, then He made Mahaprabhu, Krishna, appear. By Advaita Acarya’s calling Krishna appeared. Therefore it is a very auspicious day so we should speak something on Srila Advaita Acarya and beg for His mercy. If He bestows His mercy on us then we can get Caitanya Nitai, otherwise we cannot. That means Advaita Acarya is bhakta-avatara. The panca-tattva is bhakta-rupa, bhakta-svarupa, bhakta-avatara, bhaktakhya and bhakti-sakti. Bhakta-rupa is Mahaprabhu in the form of a devotee. Bhakta-svarupa is Nityananda. Bhakta-avatara is Advaita Acarya. Bhaktakhya is Srivasa and bhakta-sakti is Gadadhara; panca-tattva. Gaura-ganoddesa-dipika states, bhaktavatara acaryo’dvaito yah sri-sadasivah. Advaita Acarya is bhaktavatara and He is also Sadasiva, Sadasiva Maha-Vishnu avatara. When we say Maha-Vishnu avatara then Sadasiva comes. This is Advaita Acarya. This is advaita-tattva. Advaita Acarya is such a devotee that He made Krishna descend here. Advaita Acarya’s father’s name was Kuvera Misra and His mother’s name was Srimati Nabhadevi. They were first living in Srihatta. 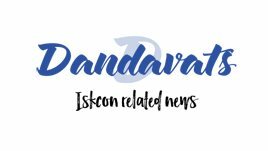 Kuvera Pandita, the father of Advaita Acarya, had no son for a very long period. In his old age he got this son Advaita Acarya. In Srihatta district there was a village named Nava-grama. That is the birthplace of Advaita Acarya. He appeared on this day in the month of Magha saptami, on the seventh day of the bright fortnight, Magha sukla saptami. After that Kuvera Pandita wanted to go and stay on the bank of the Ganges. He left and shifted his residence from the bank of the Ganges to Santipura. Santipura is now famous as Advaita’s dhama, patha. He is also called Santipura-natha, Lord of Santipura. When Kuvera Pandita performed the nama-karana, name giving ceremony, of his son, he gave one name Mangala and another name Kamalakna, but why is He called Advaita Acarya we quoted already from Caitanya-caritamrta. Advaita Acarya’s father and mother disappeared when he was very young. Feeling very distressed he went on pilgrimage visiting many, many holy places. When He came back, some of His relatives requested Him to marry. Therefore, at the request of the relatives He was willing to marry. At that time one very pious orthodox brahmana was living there whose name was Nrsimha Vaduri. He had two daughters; their names were Sri and Sita. They were both very beautiful and Advaita Acarya married both of them. Thus Advaita Acarya had two wives; Sri and Sita. Sita Thakurani is famous. Advaita Acarya is also famous as Sita-natha or Sita-pati because the name of His wife was Sita Thakurani. Sita Thakurani is an incarnation of Yogamaya, and Sri devi is a manifestation of Yogamaya. Advaita Acarya is a Maha-Vishnu avatara and in Maha-Vishnu there is Sadasiva therefore we call Him Sadasiva avatara. When Advaita Acarya grew up, He saw how the people of this Kali-yuga are suffering and He could not tolerate it. He thought, “I must make Krishna, the Supreme Personality of Godhead, appear here.” Who can make the Supreme Lord appear? It is stated, bhaktera icchaya krshnera sarva avatara Cc Adi 3.112], and bhaktecchopatta-rupaya, [Bhag. 10.59.25] by the desire of His dear devotee the Lord appears. No one can make the Lord appear. He is not our order carrier. However He has said, aham bhakta-paradhino. One who is His very dear devotee, intimate devotee, prema-bhakti, Krishna said, “I am dependent on him. I have no independence.” Though He is supremely independent. He said this to Durvasa Muni, “I have no independence”. He, who is supremely independent, says, “I have no independence. I am bhakta-paradhino, I am dependent on My bhakta. What My bhakta says I do.” So what a dear devotees says Krishna does. If a dear devotee says, “Please come down here”, then He comes down here. Bhaktera bhaktera icchaya krshnera sarva avatara, all incarnations are there by the will of a bhakta [Cc Adi 3.112], and this is also mentioned in the verse bhaktecchopatta-rupaya paramatman namo ‘stu te. [SB 10.59.25] Thus, without the call of His dear devotee Goloka-bihari, Purna-brahma Krishna will never descend here. He never comes here for ordinary reasons. In the Bhagavad-gita Krishna has said, “When there is a rise of irreligion and when bhagavata-dharma is declining, miscreants, demons are rising and sadhus, bhaktas are persecuted, at that time I descend to kill the miscreants and protect the sadhus and establish bhagavata-dharma.” For that purpose His incarnation descends. At one time all the demigods headed by Brahma, went to the bank of knira-sagara, the milk ocean, and offered prayers to Krishna. By their prayers Krishna appeared. Similarly, by the prayers of Advaita Acarya, Prema Purunottama Gauranga Mahaprabhu appeared in this material world and manifested His lila. Advaita Acarya could not tolerate the suffering of the jivas of Kali-yuga. He was crying in His heart. Therefore He thought, “I must make the Supreme Lord Krishna appear here”. He is isvara [the controller], He is non-different from Hari therefore He is advaita [oneness, non-dual]. 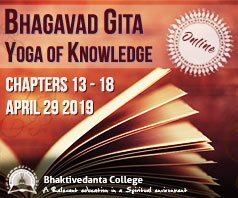 Here it says, [referring to Cc Adi 1.12-13 above] “Advaita Acarya, because He is non-different from Hari, the Supreme Lord, He is called Advaita, and because He propagates the cult of devotion, He is called Acarya”. Therefore he is called Advaita Acarya. Caitanya-caritamrta states the same, advaita-acarya gosani saknat isvara, because He is non-different from Hari, saknat isvara. Yanhara mahima nahe jivera gocara, ordinary jivas cannot understand the glory of Advaita Acarya. Maha-Vishnu avatara, He is an incarnation of Maha-Vishnu, and therefore He could feel the pains of the jivas here because all jivas come from Maha-Vishnu. He was a Maha-Vishnu avatara, and He could feel the suffering and pain of the kali-hata jiva. He observed that there was no bhakti in Kali-yuga and therefore He promised, “I must make Krishna appear to propagate bhakti”. tabe se ‘advaita’-nama krshnera kinkara! Advaita Acarya promised, “I must make Krishna appear here and show Krishna to every one. If I do not, then I will not be known by the name Advaita Acarya, krshnera kinkara, the servant of Krishna.” He made this promise. It is a wonderful promise. Who can make such a promise? Only because He is such a dear devotee He can make Krishna appear. Otherwise no one can make Krishna appear. “If I cannot make Krishna appear here, if I cannot make Him manifest here, and cannot show Him to all the people of Kali-yuga, My name is not Advaita Acarya. Then I’ll give up this name.” He made such a promise, a very strong promise. This is a very wonderful promise. No one has ever heard of such a promise. No one has made such a promise. So every day He was offering worship to salagrama-sila with tulasi leaf and ganga-jala, and uttering the name of Krishna, crying, crying, and crying. Krishna also had the desire to come down again to teach bhakti. Yoga-maya manifests all lilas. 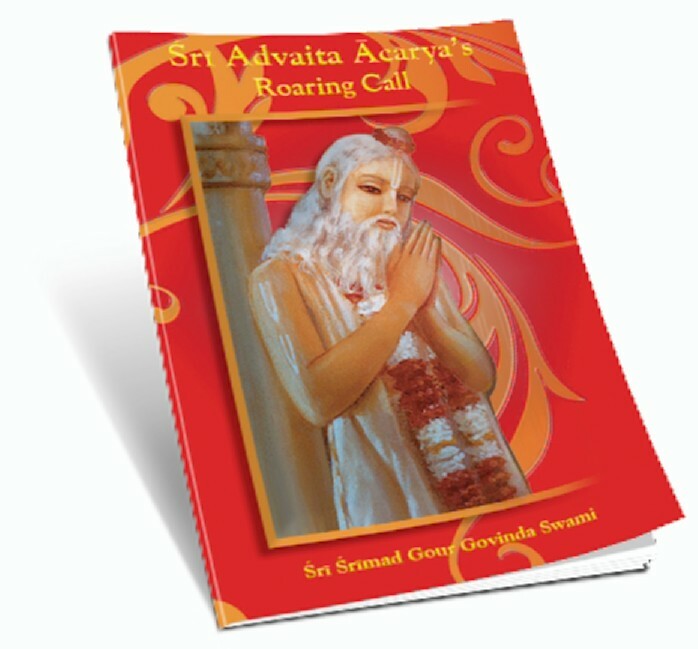 So antaranga-sakti, Yoga-maya, was waiting for Advaita Acarya’s call, “Let Advaita Acarya call.” Advaita Acarya was calling Him every day with a roaring voice, while offering worship to salagrama-sila. His call penetrated the seven layers of this material universe, entered into the spiritual sky and went to Goloka Vrndavana. Upon hearing this lila-sutra-dhari, Yoga-maya thought, “Advaita Acarya is calling. Now I must make Krishna appear as Gaura.” Therefore Prema Purunottama Gauranga Mahaprabhu appeared. This is one of the reasons of Gaura’s appearance. Bhaktera icchaya krshnera sarva avatara [Cc Adi 3.112]; bhaktecchopatta-rupaya [Bhag. 10.59.25], by the will of His devotee Krishna appears. Who can make Krishna appear? A dear devotee can make Krishna appear. Who is bhakta-vatsala? Who is very dear? Advaita Acarya is so dear. He is bhakti-avatara. He is a very intimate devotee. Therefore He, Sitanatha, made Krishna appear. While shedding tears of love, prema-asru, He offered puja, lit panca-pradipa and offered arati. In this way He worshiped baby Gaura Hari. Advaita Acarya Prabhu offered worship to the lotus feet of Sri Gaura Hari according to scriptural evidences and scriptural methods. He offered this prayer unto Mahaprabhu. Jaya jaya sarva-prana-natha visvambhara His name is Visvambhara. All glories to Visvambhara, who is the life and soul of all jivas. Jaya jaya gauracandra karuna-sagara, all glories to Gauracandra, who is an ocean of mercy. Jaya jaya bhakata-vacana-satyakari, all glories to He who makes the words of His devotees come true. That is Krishna’s thought, “When My devotee has promised to make Me appear, I must appear. If I won’t appear, then the words of My devotees will be false. Then no one will be My devotee.” Therefore He makes His dear devotee’s words come true. Jaya jaya mahaprabhu maha-avatari, “You are the source of all avataras.” Because He is Krishna and Krishna is the source of all avataras. So these are His jaya-gana [songs of glorification]. In this way Advaita Acarya Prabhupada offered many prayers at the lotus feet of Sri Gaurasundara. Gaurahari is karuna-sagara, an ocean of mercy, karuna-maya, merciful. He makes true what His bhakta has said, bhakta-vacana-satyakari. To those who are dina hina papi panandi, He offered that prema. Brahmara durlabha prema saba kare yache patita pamara nahi bache, it is not an easy thing even on the part of Brahma to obtain it. Mahaprabhu offered that prema, krshna-prema, which is such a rare attainment, indiscriminately to all patitas (fallen), pamaras (the most degraded souls), papis (sinful men), panandis (atheists), dina (distressed) and hina (inferior). Thus it is by the calling of Santipura-natha, Santipura-pati Advaita Acarya, that Mahaprabhu appeared. Therefore His appearance day is a very, very auspicious day. Jaya karuna-maya Santipura-pati Advaita Acarya Prabhu ki jaya! Please shower Your mercy on us most degraded jivas. O Advaita Acarya Prabhu, if You shower Your mercy on us then we can get Gaura and Nitai. Otherwise what is the value of our life? So on this day we must offer prayers at the lotus feet of karuna-maya, the most merciful Lord of Santipura, Sri Sri Advaita Acarya. This is only a brief summary about Advaita Acarya Prabhu’s life. At last we offer some prayers unto Him. So we will sing a song by Locana dasa Thakura glorifying Advaita Acarya. If you do not sing it, you cannot relish it. Therefore you should all sing it. Hunkara means roaring call. With thunderous voice He was calling, “Please, please come down, please!” Yara huhunkare gaura avatara haya, by whose roaring call Gaura appeared. The bestower of prema Sitanatha, the husband of Sita Thakurani, is an ocean of mercy, by whose loving mellow the all-merciful Gauranga Mahaprabhu came down. Sriman Mahaprabhu came down here and bestowed His mercy on Advaita Acarya Prabhu. If one is fortunate to get the mercy of Advaita Acarya then he will be able to glorify Caitanya Mahaprabhu. One who takes shelter at the lotus feet of Advaita Acarya is very fortunate and will definitely get gaura-prema, which is an invaluable asset. This is a song written by Locana dasa Thakura glorifying Advaita Acarya Thakura. Jaya karuna-maya Santipura-pati Sri Sri Advaita Acarya Prabhu ki jaya! Advaita Acarya Prabhu ki subha avirbhava-tithi ki jaya! Samaveta bhakta vrnda ki jaya!